In Deep & Wide, author and pastor Andy Stanley identifies some of the key decisions and strategies behind the founding of North Point Community Church in 1995, describing how and why it continues to flourish. 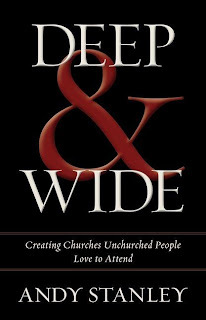 Although this book is specifically about the stories of how God worked to propel the movement of the church through the six locations and the 25 strategic partners of North Point Community Church in Atlanta, GA, there are some important principles that Andy laid out that we can all learn regarding church growth, particularly creating church movement that unchurched people love to attend. In chapter 3, he explains how the word 'church' is really translated from the Greek word 'ekklesia' - which is actually not a religious term, but rather, simply refers to citizens called to gather for civic purposes. An 'ekklesia' was simply a gathering or an assembly of people called out for a specific purpose. 'Ekklesia' never referred to a specific place, only a specific gathering. He then elaborates the historical background of how throughout the years, our concept of church has changed from a specific assembly to become a specific assembly hall! In AD 313, Constantine, soon to be the next Roman emperor, embraced and legalized Christianity in Roman empire. In general, he even legalized freedom of religion. Before this edict, Christianity had been outlawed because Christians insisted that Jesus, not the emperor, was their King. Furthermore, Christians refused to accept any emperor as divine. Consequently the church suffered intense persecution for the first 300 years of its existence, especially during the reigns of emperors Nero, Domitian and Diocletian. Christians were barred from positions of authority, ostracized by their communities and stripped of property. But with the arrival of Constantine, things began to change. It all began when Constantine's power grew, tolerance for Christianity grew as well. Then something big happened! Constantine declared himself a Christian. (For a detailed description on how Constantine became a Christian, read http://www.christianitytoday.com/ch/131christians/rulers/constantine.html). It is as if, after generations of failed attempts to stamp out this Jewish knock-off religion centered around a Galilean carpenter, the emperor himself joined the cult. Suddenly, it became fashionable to be Christian. Before Constantine's rise to power, Christian worship was relatively informal. Believers met in homes, enjoying what they called "love feasts", the ancient equivalent of a potluck banquet, singing hymns, reading Scriptures, discussed theology, etc. After Constantine's conversion, powerful people brought their former notions of worship with them as they professed belief in Christ and began influencing Christian communities. Christian worship began to incorporate elements of imperials protocol, including incense, ornate clothing, processionals, choirs, etc. Within a decade, the ekklesia ceased to be a movement. It was no longer an expanding group of people sharing a unique identity and purpose. It has become a location. The Romans called each of these gathering places a basilica, the Latin word used to denote a public building or official meeting place. Gothic (or Germanic) cultures, also influenced by Christianity, used the word kirika, which became kirche, in modern German - the word that means "house of the lord", to refer to any ritual gathering place, Christian or pagan. The German term kirche and the Greek term ekklesia refer to two very different ideas. A kirche is a location. An ekklesia is a purposeful gathering of people. You can lock the doors of a kirche. Not so with the ekklesia of Jesus. What began as a movement, dedicated to carrying the truth of Jesus Christ to every corner of the world, had become an insider-focused, hierarchical, ritualized institution that bore little resemblance to its origins. This shift led to an era of church history that can only be described as horrific. The atrocities carried out in the name of the church would be considered terrorism by modern standards. Hypocrisy draped itself in priestly robes. In 1453, the Ottoman Empire conquered Constantinopole - the capital of Roman empire. What was seen as a tragic turn of events for the empire turned out to be a blessing in disguise for the true church. As the threat of an Ottoman invasion materialized, Christians scholars fled westward to Europe, carrying with them ancient Hebrew and Greek manuscripts of the Bible. These manuscripts were then picked up by the reformers, especially by a man called John Huss, who were of the conviction that the Bible, not the pope, was to be the church's final authority. This is because at that time, church officials were the only ones who had access to the Bibles - which were a Latin translation called the Vulgate, originally created more than a thousand years earlier! These were either locked up in libraries or chained to the pulpits. As Greek and Hebrew manuscripts found their way into the hands of church reformers, it was decided that they should be translated into a language that common people could read. In 1522 William Tyndale determined to translate the Bible into English. However, finding no support in England, he traveled to Germany, where he completed his translation from the Greek rather than the Latin texts. In 1526, Tyndale began smuggling printed copies of this English Bible into his homeland! Making the Bible available to his countrymen made Tyndale an outlaw in England. Government and church officials plotted to arrest him and try him for heresy. A tribunal of the Roman empire condemned him as a heretic and turned him over to civil authorities, who bound him to a beam, strangled him with a rope, burned his body and scattered his remains. In other words, "church" officials executed a man for translating and distributing the words of Jesus in a language that adults and children could actually read and understand. Thanks to the courage of men like Tyndale, Huss, Luther and others, the ekklesia of Jesus became a movement once again through the Protestant reformation. 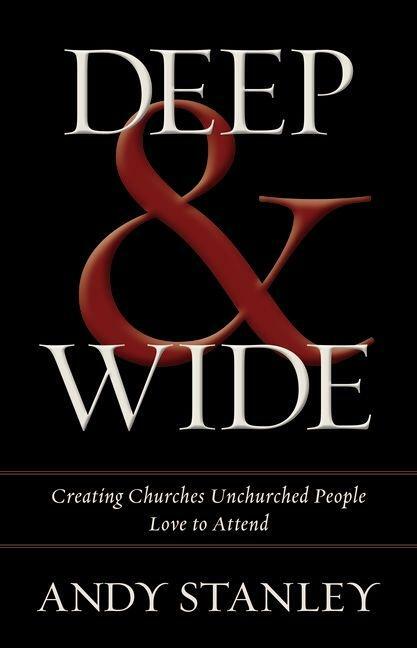 In chapter four, he talks about a church for church people vs church for unchurched people. However, the corollary of being a church for unchurched people was that we had a tendency to be against everything unchurched people were for. We were against just about everything at one time or another. We were against certain genres of music, alcohol, gay people, etc. But, asked Andy, who is the church really for? Who gets to participate? How good do you have to be? Which sins, if any, disqualify a person? How much baggage does a person have to leave at the door before being admitted? Can someone participate in a church if he or she is still working things out? There is something inside of us that would like definitive answer on every nuance of every issue. As Andy said, he grew up around people who believed that the church was for saved people who acted like saved people. The catch was they were the ones who decided what act like a saved person meant. They were the ones who determined which sins saved people could commit and which ones were evidence of being unsaved. But the irony is the lists changed every few years - for example, divorce was on the list for a long time. But that one began mysteriously disappearing in the 1970s. He reminded us that if there is a right way of doing things, then there is a wrong way as well and nobody wants to be wrong! The issue is: is that issue worth fighting for? We are not mistakers in need of correction. We are sinners in need of a Savior. We need more than a second chance. We need a second birth. Andy also talked about communications in that chapter. He says, and I heartily agree that there are several questions that his church has decided ahead of time not to answer via emails. But their staffs would sit down and discuss in person. Andy has a very positive outlook - he says that he would try to read all the critical emails and letters because as he says correctly, that he does not learn much from people who agree with him. He wholeheartedly agree that both grace and truth are the two equal pillars that must balance the foundation of the church. It is easy to side into either side. Chapter six is slightly similar to chapter four on how we, as a church, has been barking at the wrong tree on many occasions. He started off the chapter by saying that if you want to know what people mean by what they say, watch what they do. Actions do not only speak louder than words, actions should be used to interpret words. In the early church, thousands of Jews and converts to Judaism embraced Jesus as Messiah. These early followers of Christ did not consider themselves converts to a new religion but simply a fulfillment of what had been promised through Abraham and the prophets. However, as the message spread, eventually the message outflowed into non-Jewish regions. Gentiles heard and believed and some of the Jewish apostles like Paul became intentional with their Gentile evangelistic efforts. However, whereas Jews in the Jesus gatherings did not consider themselves as converts, the Gentiles believers did. They viewed themselves as converts from paganism. The question was: What exactly were they converting to? In their minds, they were leaving their pagan beliefs to become followers of Jesus. They did not view their conversions as conversions to Judaism. And that was a problem for the Jewish believers because in their Jewish minds, how could someone become a follower of the Jewish Messiah without becoming Jewish? It is easy to understand why these first-century Jewish Jesus followers felt a bit uneasy or even offended with this sudden influx of non-Jewish outsiders. Whereas Gentile believers abandoned their pagan beliefs, they did not abandon their pagan behaviors. Gentile believers brought their Gentile customs, habits and values right along with them, many of which were highly offensive to the Jews or even sacrilegious especially their eating habits. They knew nothing about the Sabbath, ceremonial cleansing or any of the traditions that made Saturday a day set apart. It was messy! The logical solution then was to require the Gentile Christians to become Jewish. How to do that? Just give them a list and this include circumcision! (Acts 15:1). In chapter 8, Andy shared a grim story from the life of Steve Jobs as told in Steve's biography volume written by Walter Isaacson. As a young boy, Steve Jobs attended a Lutheran church with his parents. At age 13, he asked the pastor, "If I raise my finger, will God know which one I'm going to raise even before I do it?" The pastor answered, "Yes, God knows everything." Jobs then pulled out a Life magazine cover depicting starving children in Biafra and asked his pastor, "Does God know about this and what's going to happen to those children?" The well-intentioned pastor answered, "Steve, I know you don't understand, but yes, God knows about that." Jobs declared that he didn't want to worship such a God, walked out of the church, and never went back. Andy said that how our interpretation of the events around us shape our next course of action and how simplistic answers can turn away people from God. Chapter 12 contains some interesting stories demonstrating how we had been barking at the wrong tree from time to time. Every innovation has an expiration date. At some point, new isn't new anymore, regardless of what the package says. Eventually, new new feel like yesterday's news. Bread is not the only thing that gets stale over time. Every new and innovative approach to ministry has an expiration date as well. Every single one. Nothing is irrestible or relevant forever. The danger is: some churches have not seen a new idea in decades. Oddly enough, these are often the churches that are most resistant to change. In other words, everything that is currently in place began as a challenge to the status quo in a previous generation. What's ugly now was beautiful then. What feels like irrelevant now was cutting edge once upon a time. For example, once a upon a time, the only musical instruments considered appropriate for church were the piano and organ. Drums were "worldly." Electric guitars were "satan's instrument." Even preachers had to preach an entire message on whether it was ok to clap in church" ok to peach during Sunday evening service but not during morning service, or what? New ideas are generally considered bad ideas. Then they become normative. Then, eventually they are yesterday's news. Nothing is new or innovative forever. Your best idea, the one that other churches emulate and take credit for, will eventually become obsolete. We are foolish to assume our ideas are transgenerational. However, the way things are done at your church is so deeply ingrained that often you will meet resistance at every turn. Andy further elaborated this issue in the following chapter on mission versus model. The changes people resist are changes associated with way ministry is done, the model the church has adopted. Unfortunately, because the model defines the church, more than anything, the model determines the status quo. "This is how we do it here. This is who we are." Over time, churches fall in love with their models. But models are meant to be a means to an end. Models are created to support the mission of the church. And one of the primary reasons churches are empty is because church leaders love their models more than they love people. "If you want to know what people mean by what they say, watch what they do. Actions not only speak louder than words, they interpret an individual's words." In the closing chapter, Andy shared an interesting story on the parable of the credit card.